Last post I showed you one of the pieces chosen for the cover of Quilting Beauties, so today I will show you the other: Ostentation. 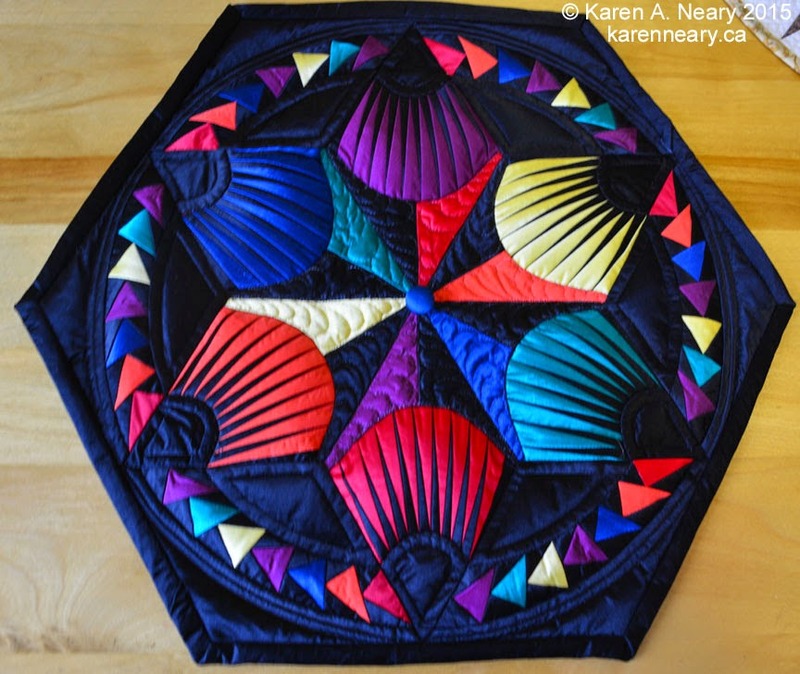 This quilt was sewn while the book was still a twinkle in my eye. I spotted these fabrics on a shopping trip to Halifax, and it was love at first sight; I knew immediately I wanted to stitch something which hinted at plumes and peacocks...without actually stitching either. To suggest feathers, spiky, pointy blocks were chosen. 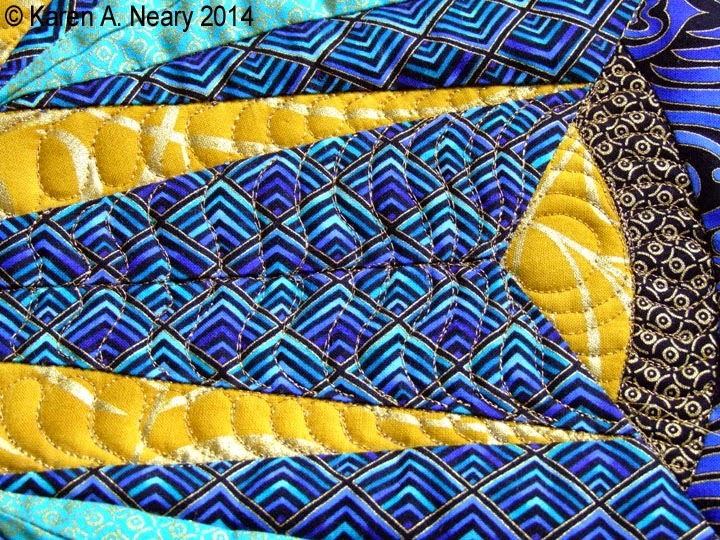 The yellow centre of the rings in the NY Beauty blocks are reminiscent of the eye on a peacock’s tail feathers. 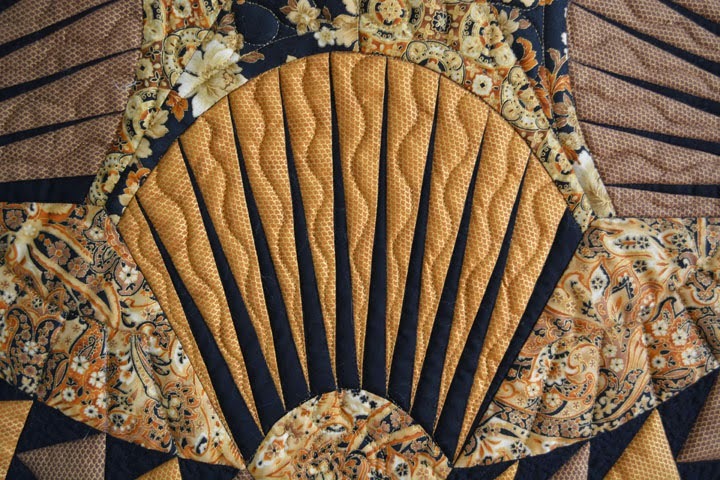 The name for a flock of peacocks is an ostentation, and it aptly describes this showy quilt. It is neither round nor oval but has elongated patches added top and bottom; a beaded black tassel further accentuates the shape. 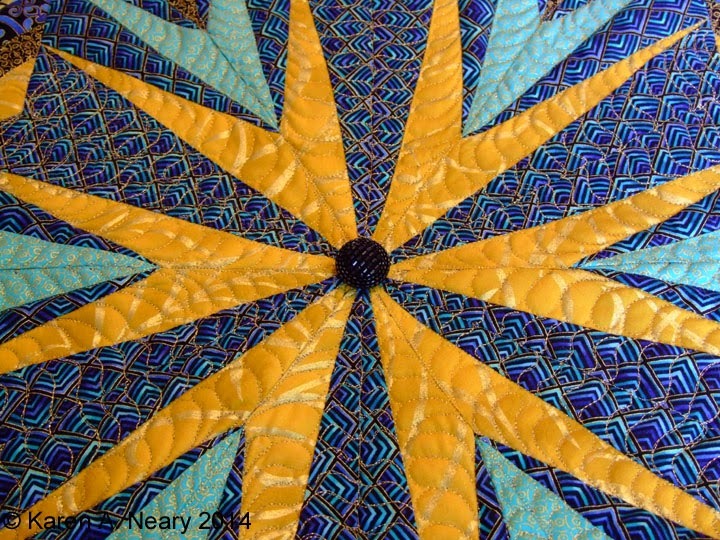 A shiny black button helps draw your eye to the centre of the quilt. 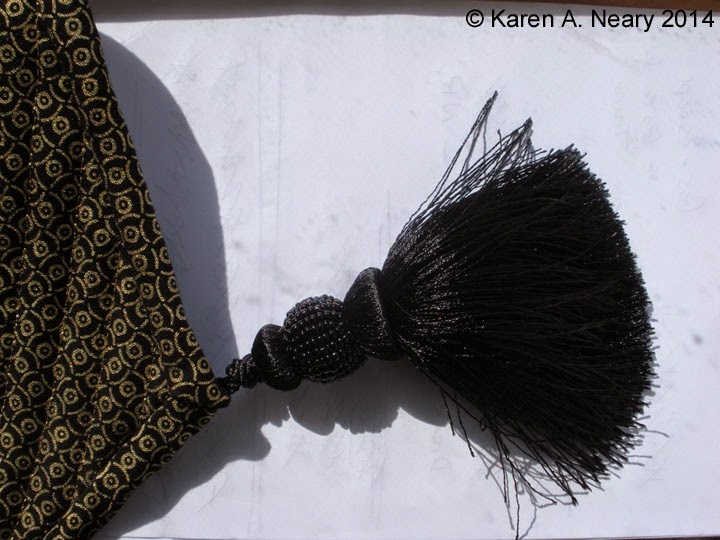 It was serendipitous to find a button to match the tassel in a different store, in a different city! 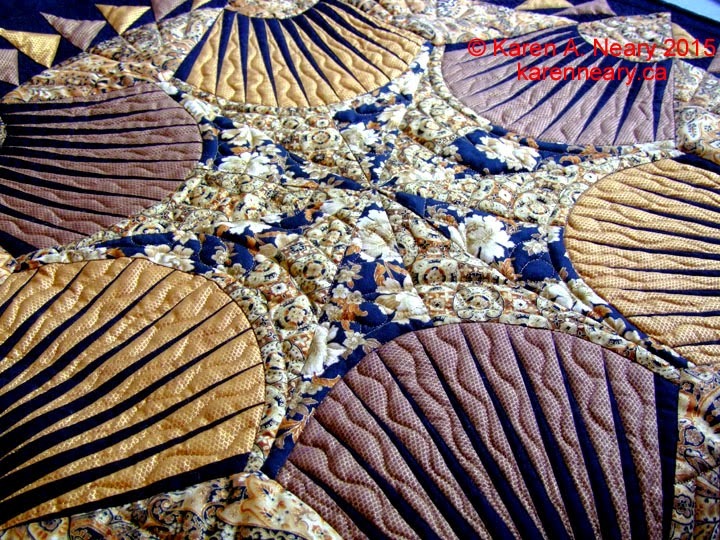 Ostentation features wool batting and is heavily machine quilted in various feather designs using a gold metallic thread. All the quilting for the book was done on my much-loved Bernina 440. 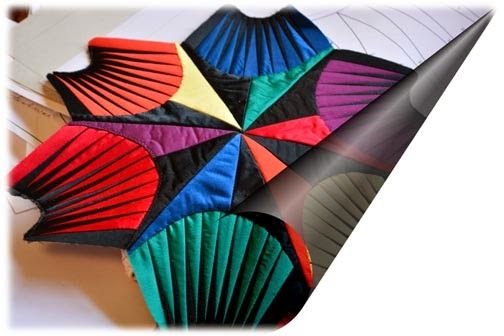 AQS did an absolutely stellar job with the piecing diagrams, showing just how simple it is to sew such a complicated-looking design. The construction is all laid out step-by-step. Before I sent it off, I blocked the quilt to make sure it was perfectly flat. You can see why I have plastic sheets to cover my work...Polly claimed the territory in the name of King and country and wouldn't let anyone near it. 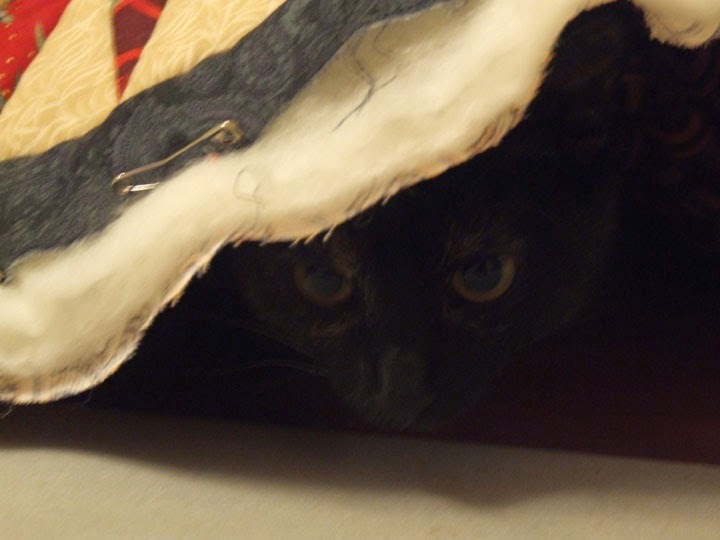 It took kitty-treat distraction to get her off the quilt. 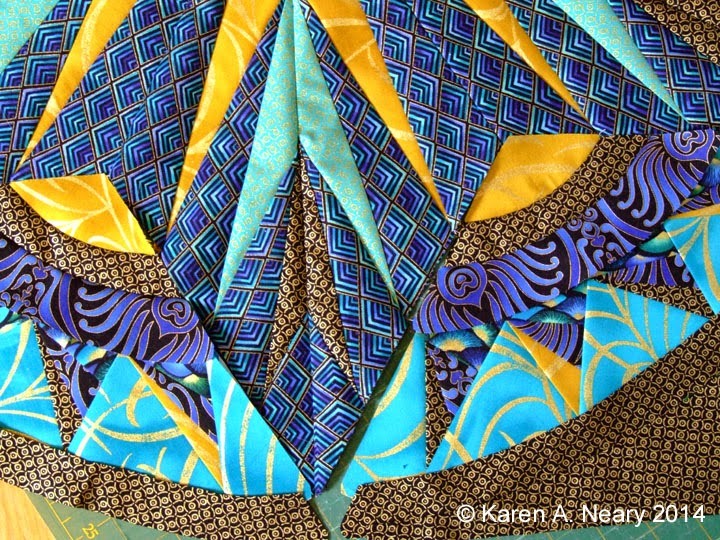 Last summer, I showed you some miniature blocks I was piecing in silk, but I never showed you the completed quilt. It's a miniature version of Florentine, from the book Quilting Beauties.One of the nice things about having the templates available on a CD is that, with a little experimentation, you can vary the size according to the scale you choose. This miniature finishes to 14". It was a real challenge to bind in that slippery silk but all in all I don't think it turned out too badly. More importantly, it was a lot of fun and I learned things I will apply to future silk projects. Here's the full sized original of Florentine (34" x 39") pieced in a gorgeous gold-laced collection generously supplied by Hoffman Fabrics. I can't recall ever loving fabrics as much as these...I could sew with them forever. There was no solid black in this collection, so I added a VERY black Hoffman batik - "raven" it's called. Gorgeous. 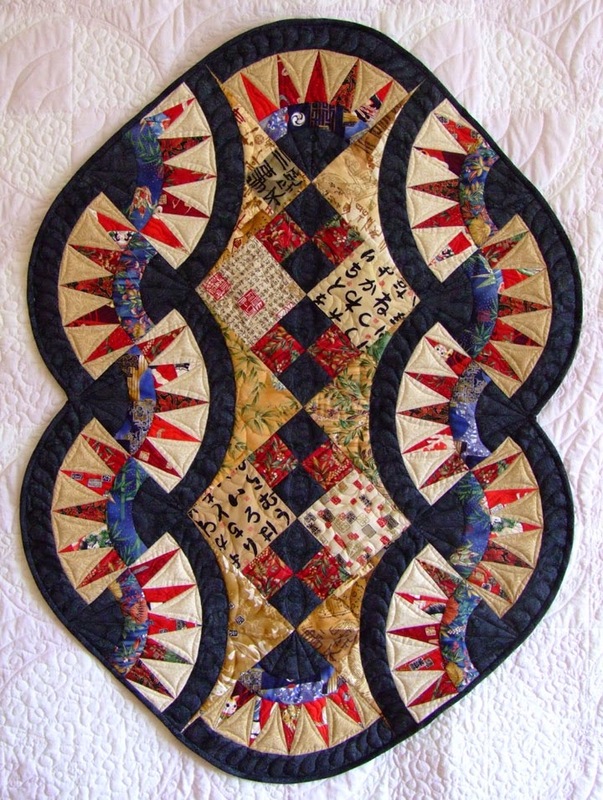 Florentine was actually one of the quilts chosen for the book cover. I love the way the New York Beauty blocks fit together, with a gaggle of Flying Geese circling the outer edge. While in progress, you can see I briefly considered adding a black circle to draw your eye to the centre of the patchwork...but in the end, decided to leave it off. That may be something you choose to add. You'll notice the miniature version above has a silk-covered button in the centre. 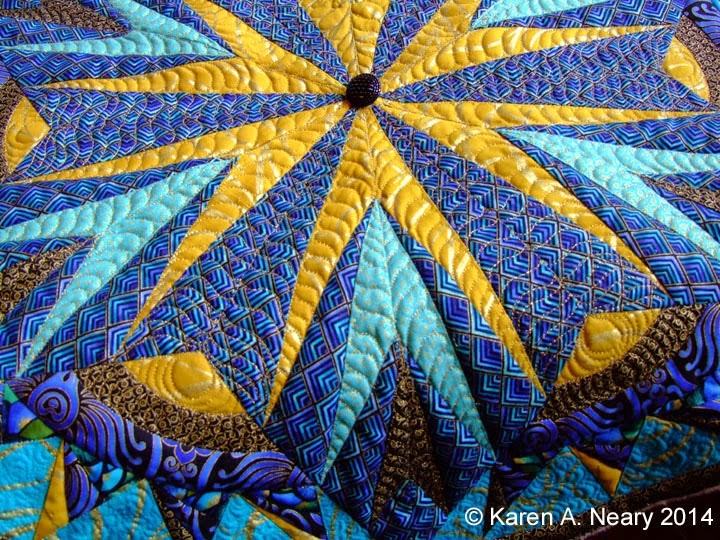 The squiggle quilting adds just the right flair. 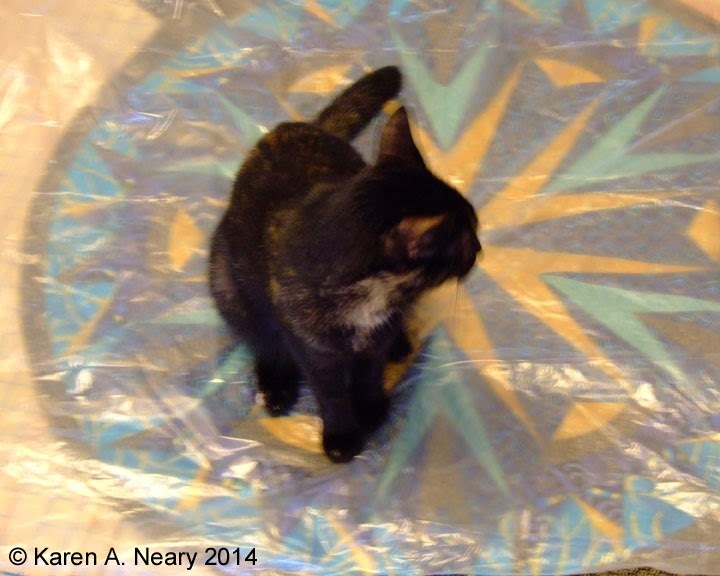 Here you see my assistant adjusting the quilt so it hangs perfectly straight. Maddie was such a big help with the photos. 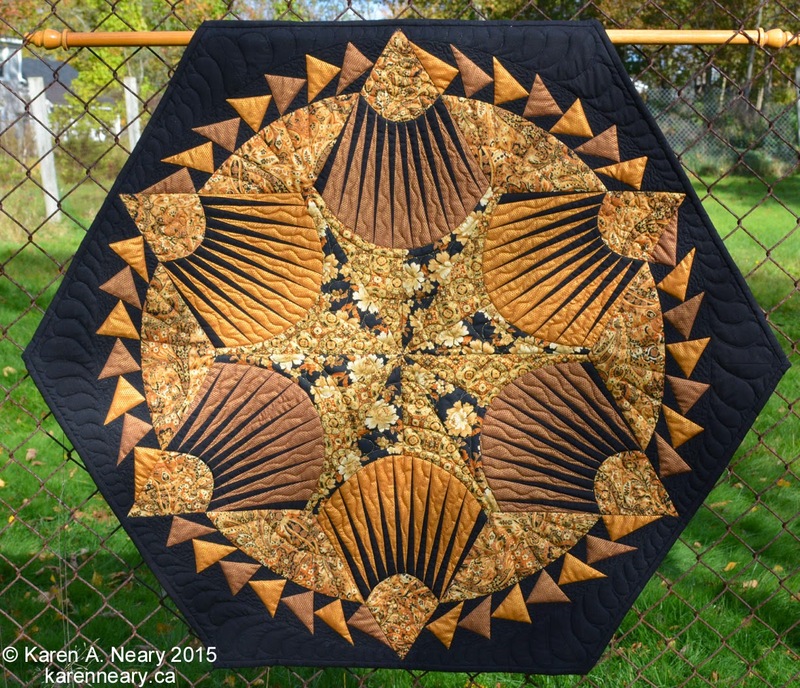 If you zoom in, you may be able to see the feather quilting which encircles the outer border of geese. 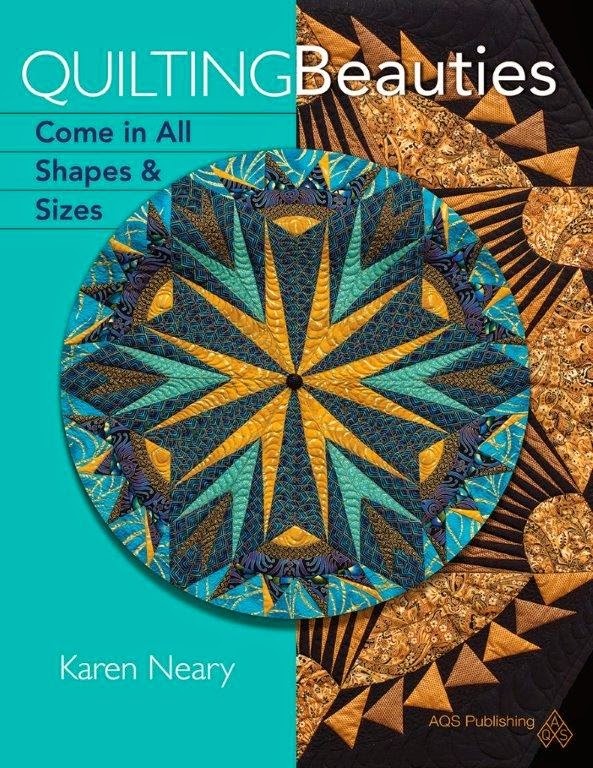 You can order your copy of Quilting Beauties here. 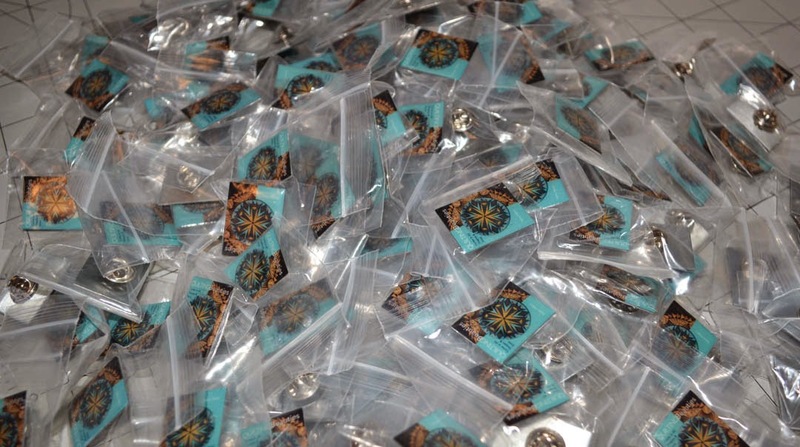 Purchases made through my website are signed, and accompanied by a cute little lapel pin. 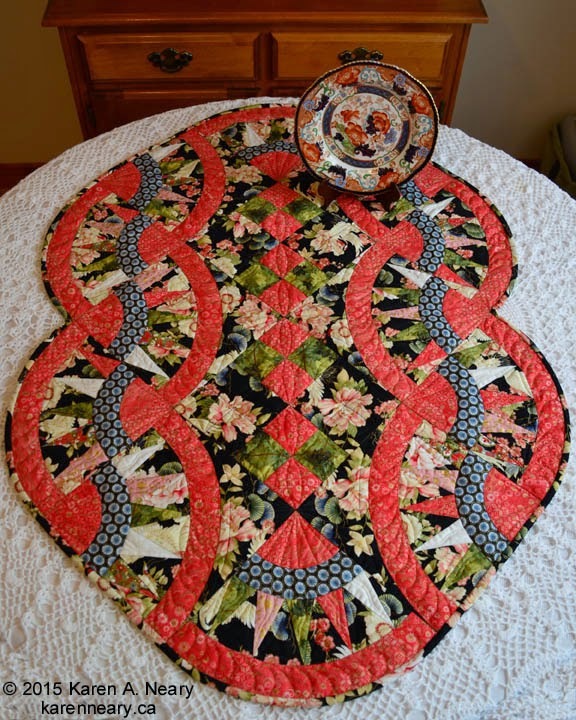 I'll share another project from the "Quilting Beauties" book, this time one entitled Asian Beauty. 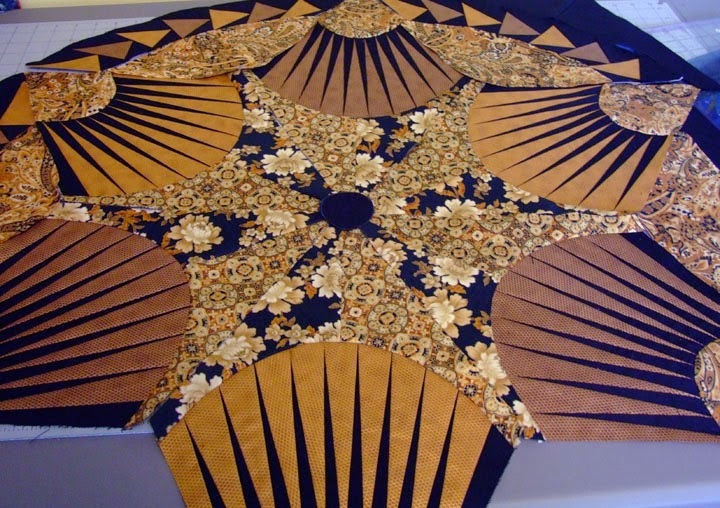 This one is really simple to sew, but it's such a pretty setting as the New York Beauty blocks merge to resemble fans. As usual, Polly put herself in charge of the project. 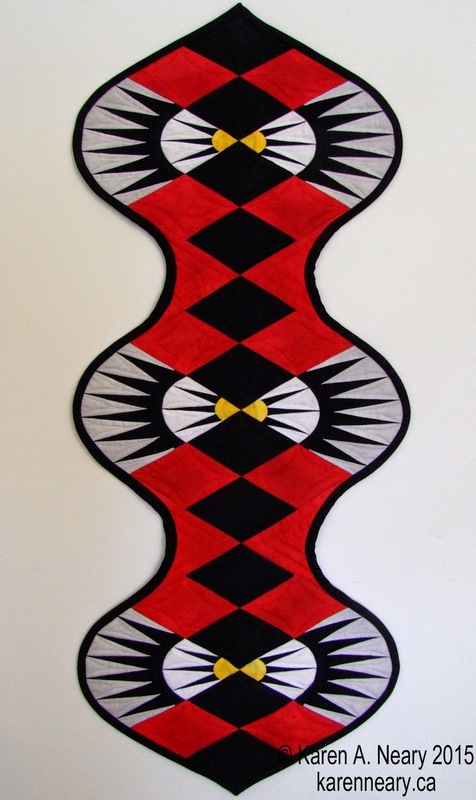 The quilting addresses my mantra of "quilt what you want them to see", so a beautiful line of feathers was stitched the length of the piece in the black bands. 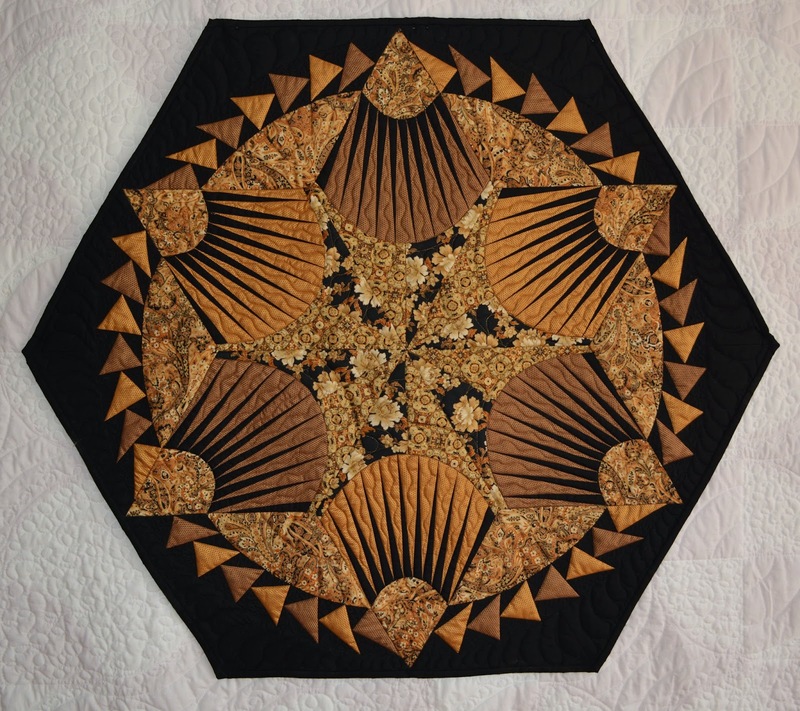 The design of black blocks down the centre also feature linear quilting to keep your eye moving up and down. while this nonsense with Maddie took place below. 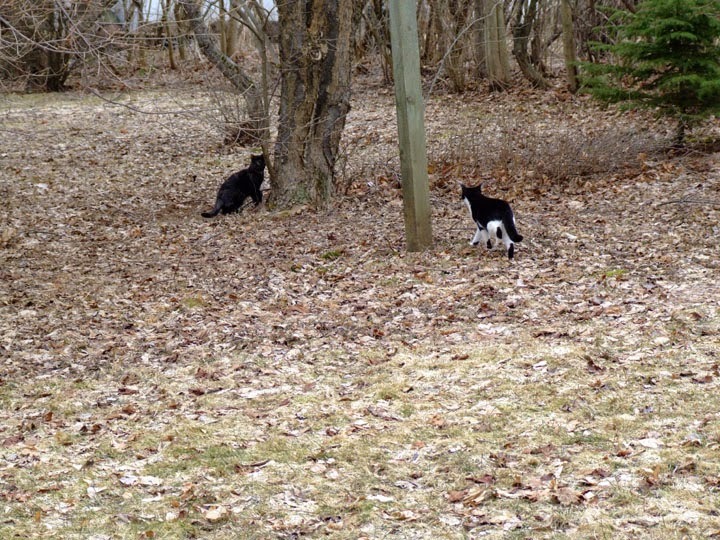 Once the chase began, I was free to take the photos! After the book projects went off to the publisher and I had a moment to putter, I found a gorgeous collection of Oriental fabrics at Mrs. P's begging to come home with me. I knew this was a perfect design for them. As I stitched, I had this nagging feeling that the colours were really familiar...and yet I had never sewn with this line before. When I went to take the photo, the light bulb came on. The colours are an exact match for an Imari china plate which had belonged to my grandmother. 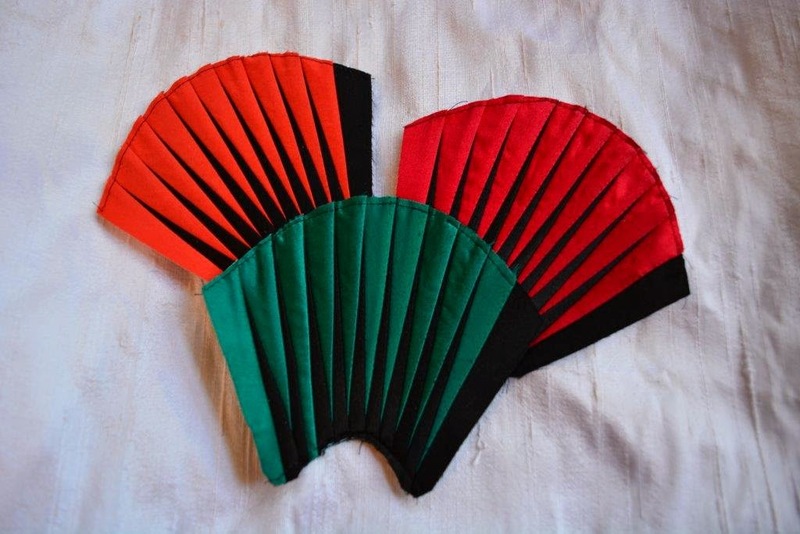 Orange red (Chinese red), green, navy and black - the colours of the china echo those in the fabric collection. They look a little off in the photographs but in person they are the same. 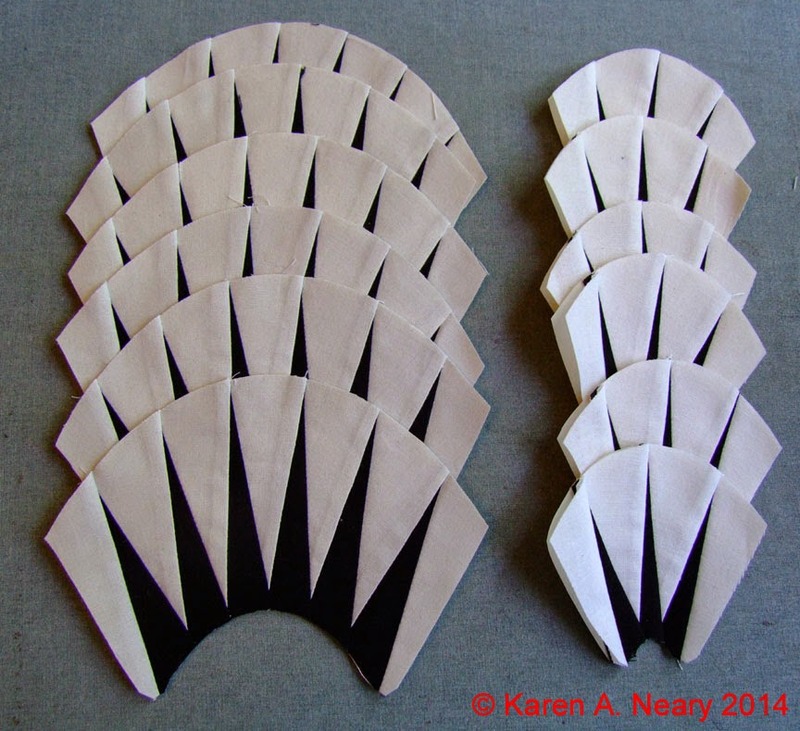 I finished off the quilting in a similar-but-different manner, showcasing the fans. 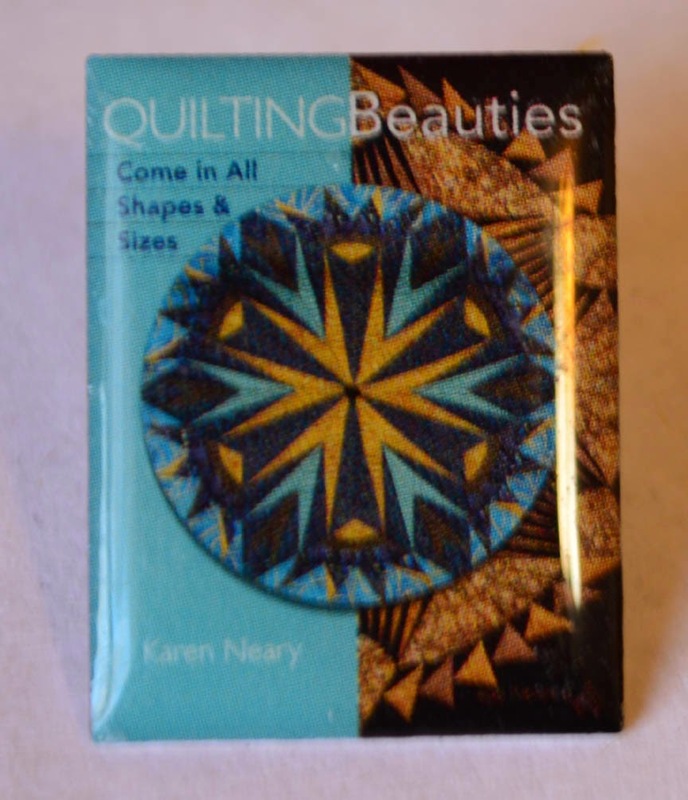 This latter piece is for sale, so if you are interested email me for details The pattern for Asian Beauty may be found in the book Quilting Beauties, available on my website.. 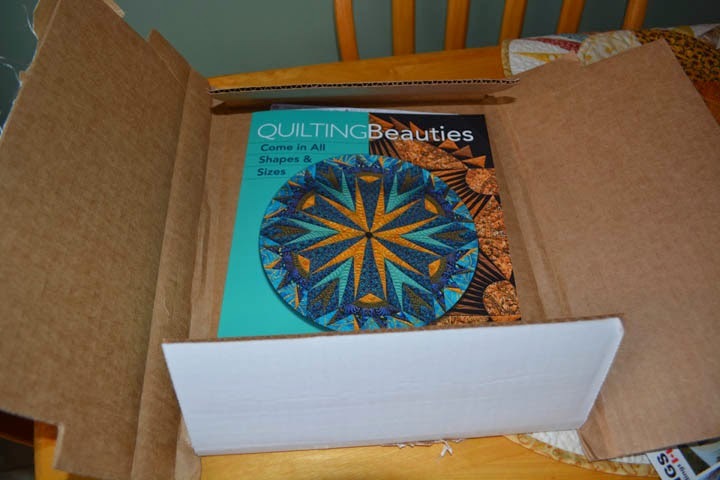 The quilts from the book Quilting Beauties have arrived back, so I'll start to show you some of the projects. 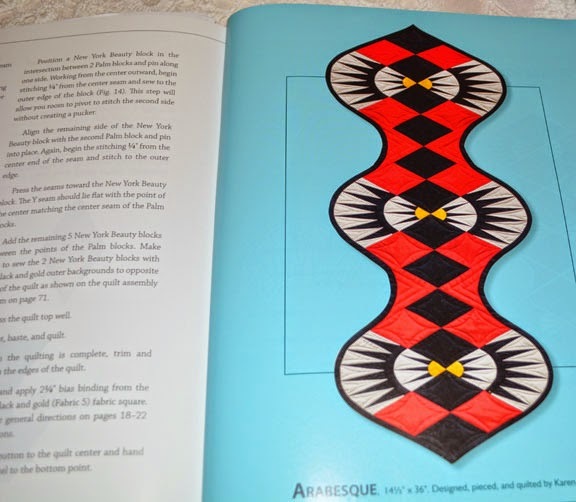 One of my very favourite pieces is a rather funky one called Arabesque. 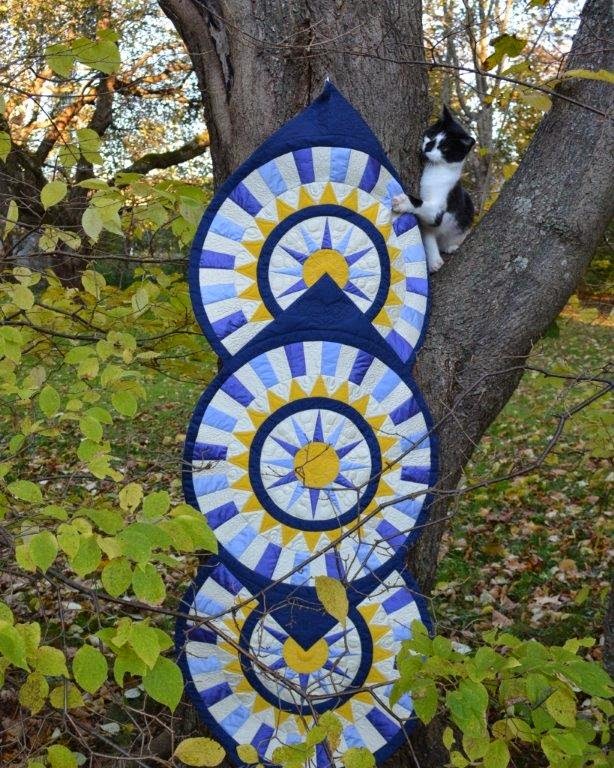 It is pieced using the Quilter's Shadow collection by Stof of Denmark, It's a beautiful fabric which functions as a solid but adds depth to the patchwork as the colours modulate across the surface. To allow the dynamic design to shine, this low-impact fabric in high contrast colours was a perfect choice. Soft grey and white are used in the New York Beauty background sections, and a bright yellow forms the "eye". Arabesque finishes to 14" x 36" and can be used on a table...but it's a stunning piece of art when hung. 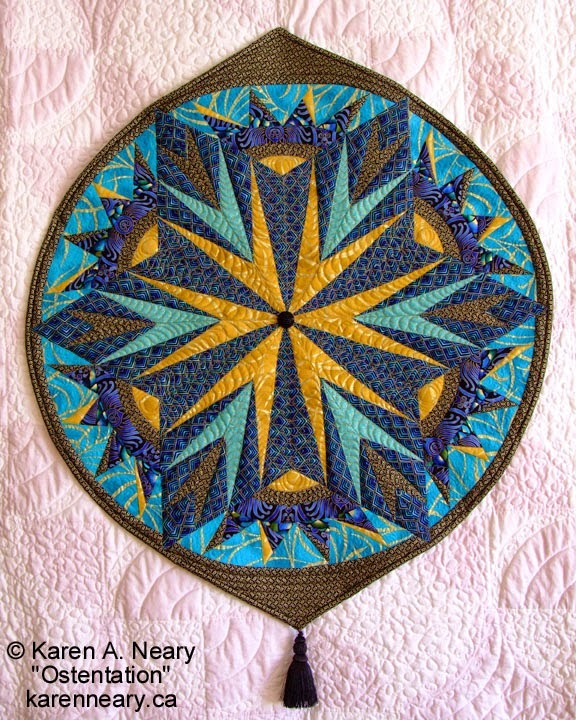 AQS liked this piece also, and chose it to display at all their upcoming "Quilt Week" shows across the U.S. this year, which is a real honour. 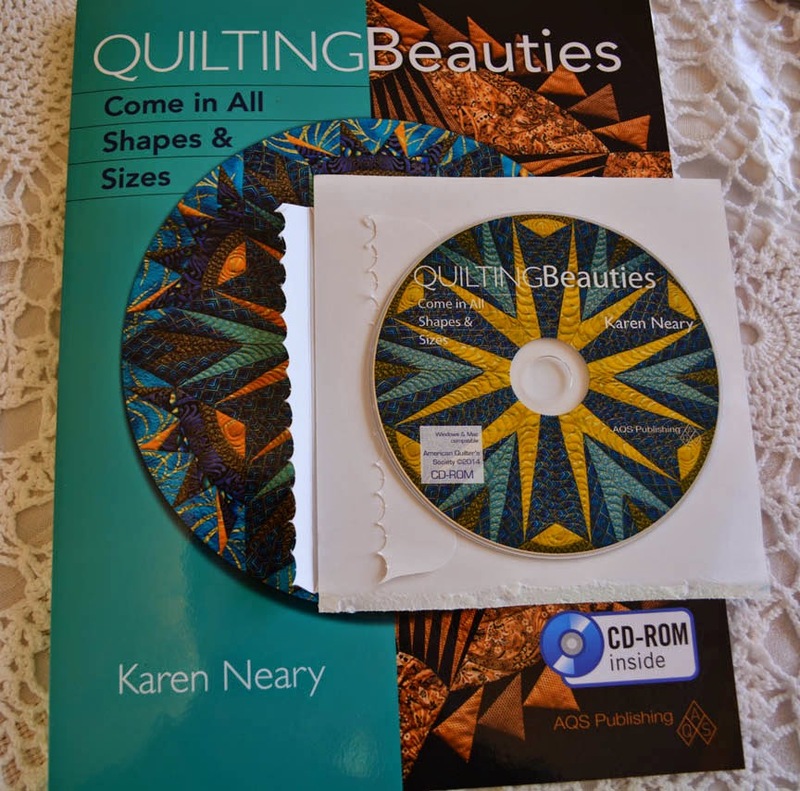 Quilting Beauties is ready to go! I spent last evening going over the book, cover to cover. Forgive my lack of modesty, but it's beautiful. 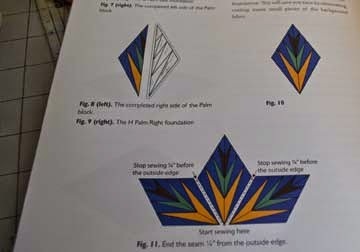 The photographs and piecing diagrams are incredibly clear and the colours are vibrant. I honestly could not be more pleased. Even the back cover is gorgeous! 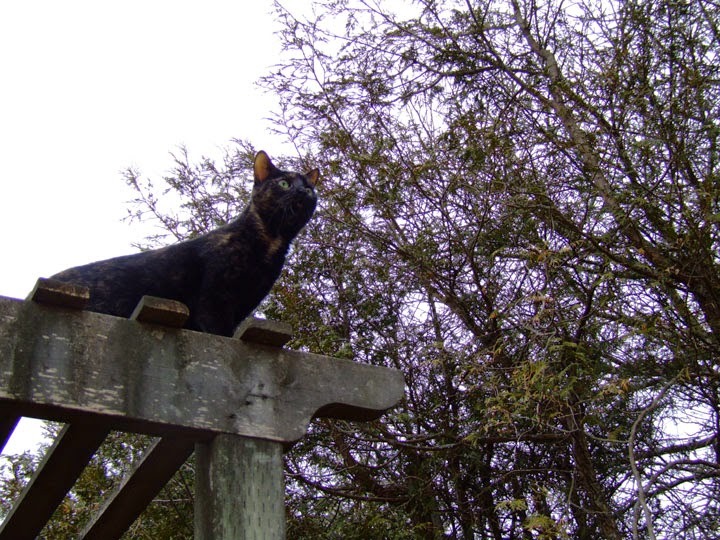 One of my favourite parts is that AQS included photographs of my precious helpers, Polly and Maddie. 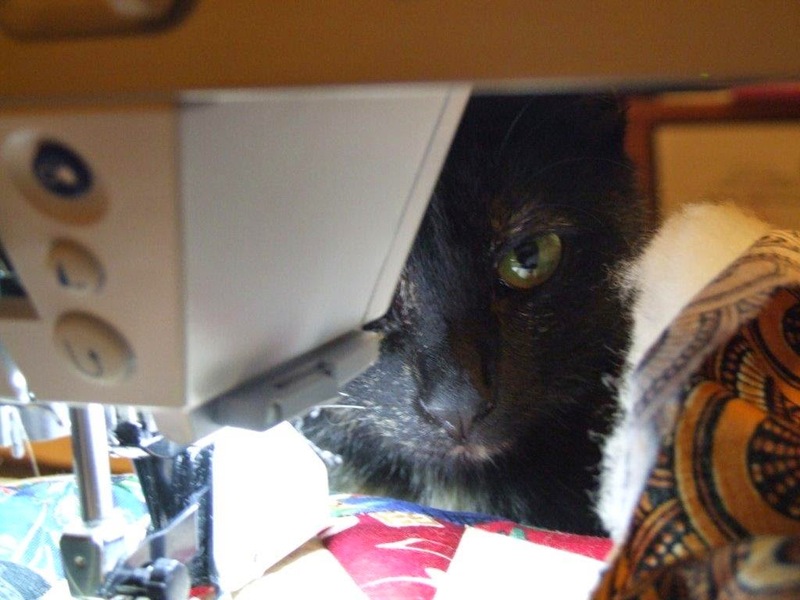 Here's Polly peeping through the harp of the Bernina,looking very serious. 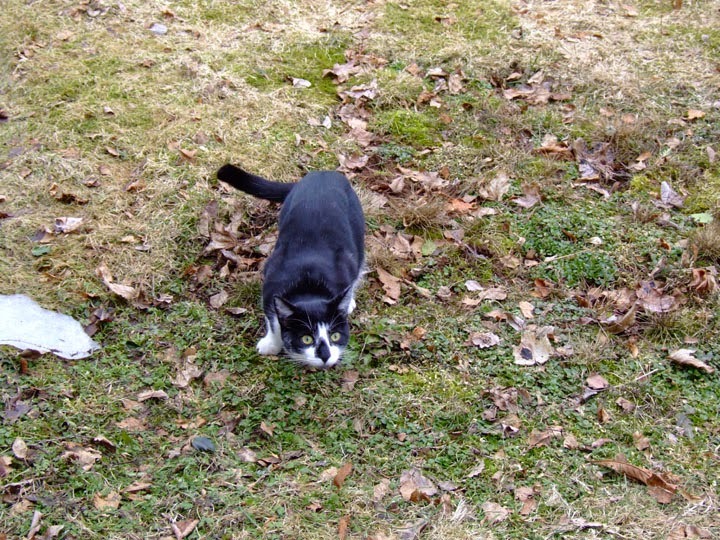 It was difficult to take a picture without mischievous Maddie popping up somewhere. 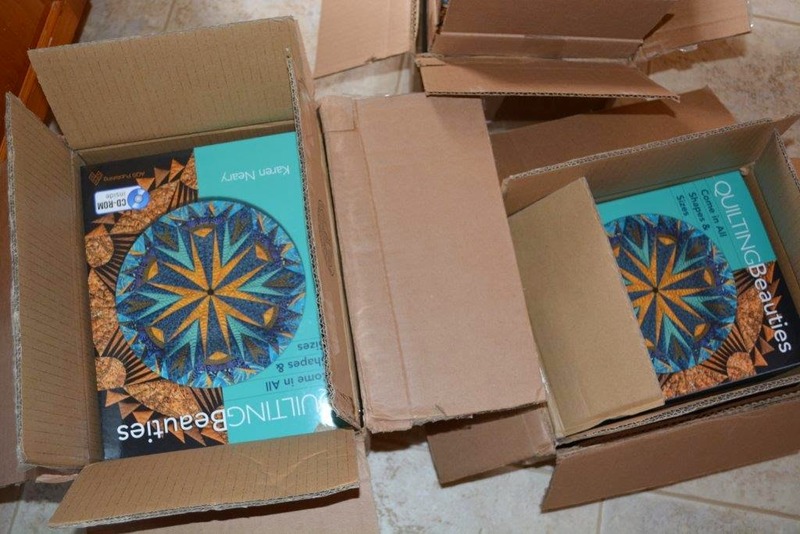 Part of the delay in the release of the book was in the production of the CD of templates, but it was well worth waiting for and I am very happy with that decision. The CD alone contains 62 pages and allows you to print what you need right at home. Since the arcs are foundation pieced, it's always a pain to try and have a book lay flat on a photocopier so that your pieces come out the right size. For those without access to a home printer, you can simply take the CD to a print shop and have them do them directly for you. The CD has cut the price of postage significantly. Cost of the book through my website is $27.00 Canadian. Based on the current rate of exchange, in US $ that works out to $22.34. I am happy to sign whatever you like on your book - just email me. I also have these adorable 1" pins and will send one along with your book, while they last. Again, thank you for all the kind and supportive emails that have been pouring in. I appreciate each and every one. The checkout is set up and ready, you can click here to order. There are three separate buttons on the page, choose the one which corresponds to your location to set the correct rate of postage. Thanks! Thanks for all the sweet emails!! This will be a quick note, I'll be back later on with a few more details. To answer about purchasing: yes, I will have signed copies available from my website to any who are interested. 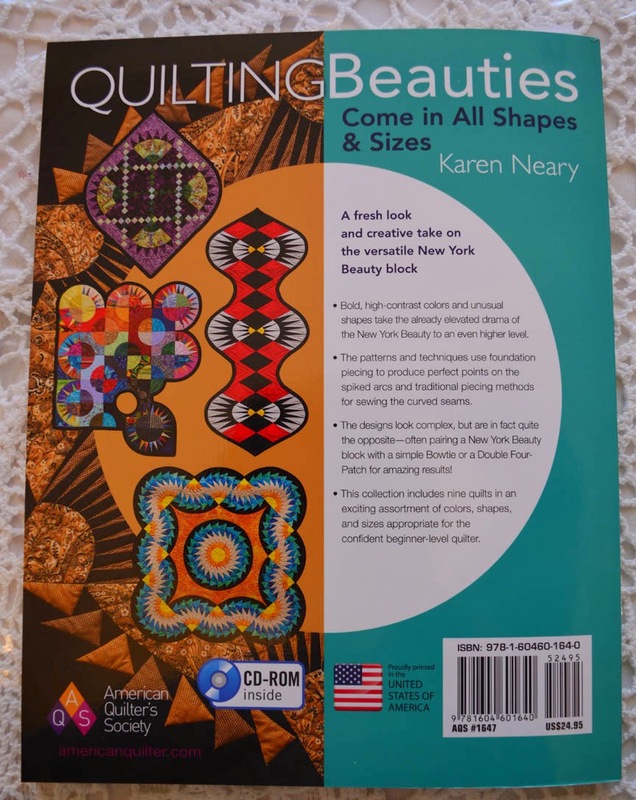 You can also purchase the book through Amazon, directly from AQS, and at your local quilt shop. Once I get the rates from the post office - hopefully this morning - I will get the checkout buttons configured on my website. Until I actually had a copy of the book, I didn't know the weight so none of this could be done ahead. Because a big part of the book is on CD, this should reflect favourably on the cost of postage. Please bear with me as things get set in place. 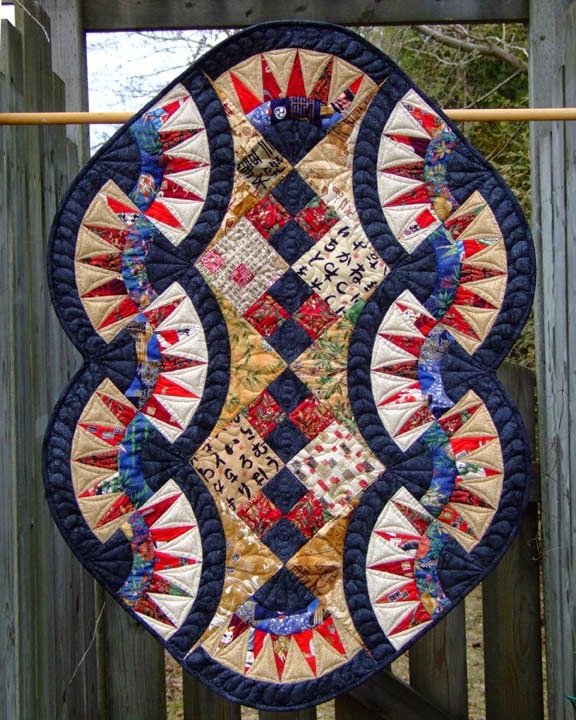 For local quilters, there will be a display of the book quilts at Mrs. Pugsley's Emporium. Beth has graciously agreed to host a signing, but the details of that are yet to be worked out. Unless Canada Customs decides to hold them for their own display(! 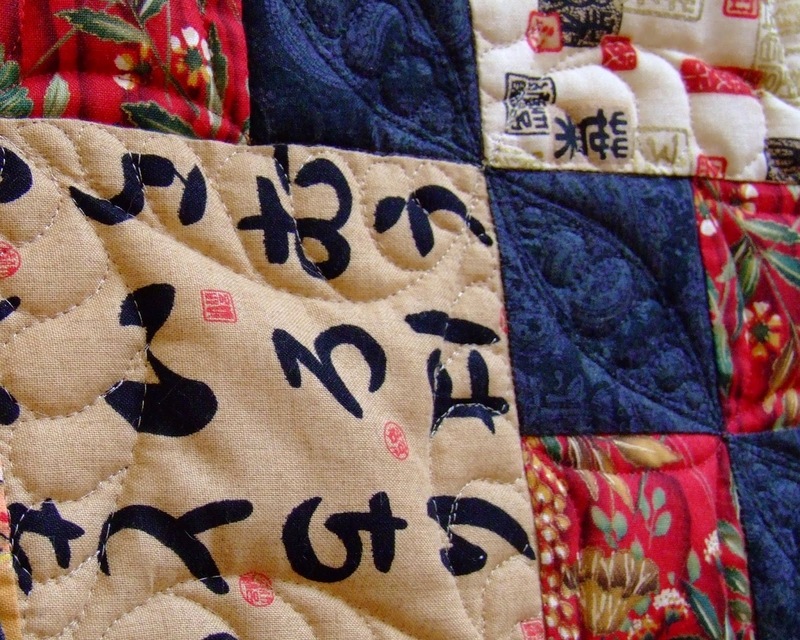 ), the book quilts should be back tomorrow. There was a big, brown envelope sticking out of our mailbox this afternoon and when I opened it up, here's what I found. Mittens! 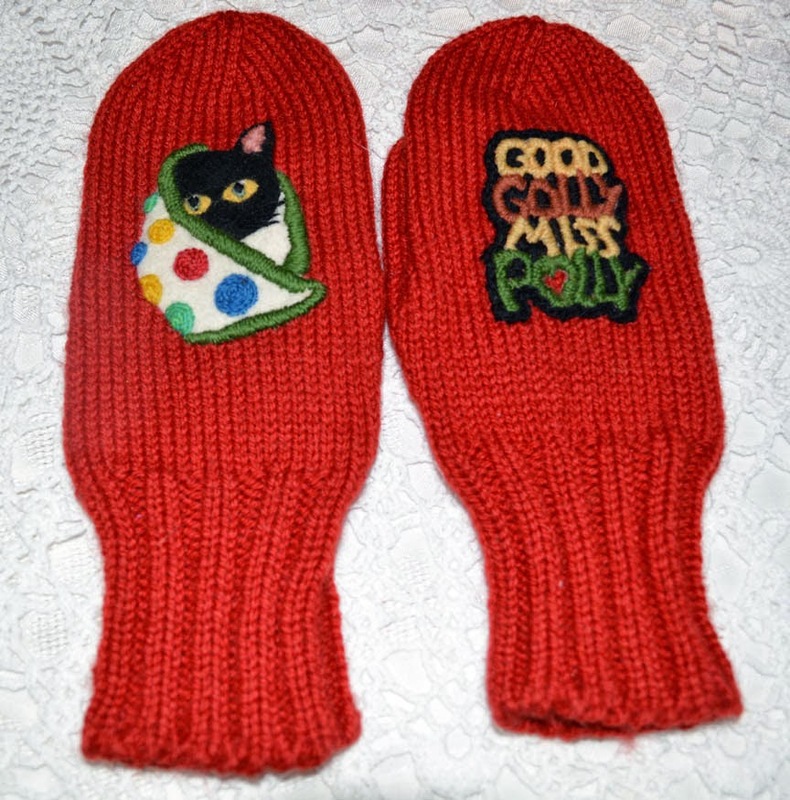 Polly mittens! Wow! These were a surprise from my thoughtful and talented friend Cheryl. The uncanny part is how well Cheryl has captured Polly's true essence. This is SO Polly, into everything and peeking out from her latest mischief. 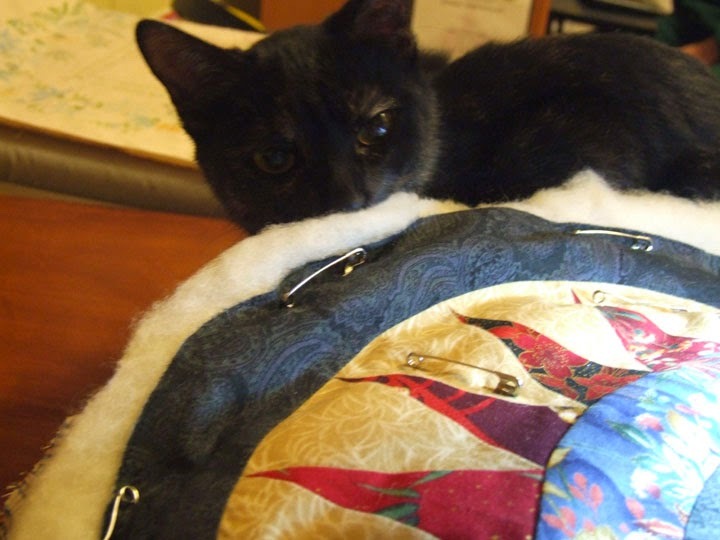 She even embroidered her in my recently completed circus quilt, in which - as you can see in my last post - Polly was quite wrapped up. They could not be more delightful, nor more appreciated - in my favourite red, no less. Thank you Cheryl for this wonderful gift. Wow!